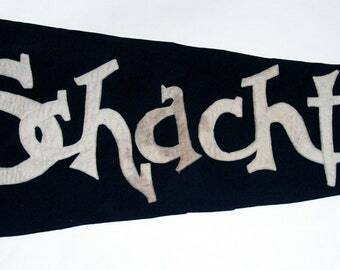 Original Early 20th Century Felt Sewn Letters Pennant Souvenir Beachwood Me.-- Free US Shipping! Dating from the 1910s-'20s, this early felt pennant from the resort beach town of Beachwood, Maine (now known as Goose Rocks, and part of Kennebunkport) has yellow sewn letters on a purple field bordered by yellow and a sewn blue cypher ME for Maine in the canton. In good condition, with little or no fading, mild soiling, but with several holes and some edge wear. It is oversized, and the felt is thick; all four of the original ties are present. 1920s-'30s Sewn Letters Felt Pennant Souvenir Duluth Minnesota -- Free US Shipping! 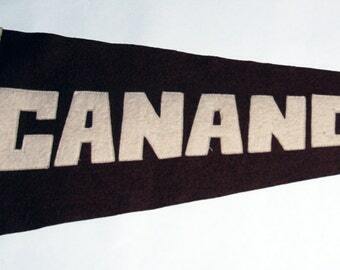 Original 1920s-'30s Felt Pennant Souvenir from Orillia Ont sewn letters -- Free US Shipping! Early 20th Century University of Toronto Sewn Letters Felt Pennant Engineering Skule School of Practical Science — Free US Shipping! Original 1920s-'30s Felt Pennant Souvenir of Princeton University -- Free US Shipping! Go Tigers! 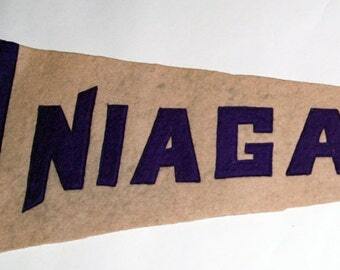 Early 20th CenturyOriginal Early Felt Pennant for North Bay Ont sewn letters -- Free Shipping! Original Early Felt Pennant Souvenir for Cook's Baths, Miami Beach Florida -- Free US Shipping! 1930s Era Sewn Letters Stratford Wool Felt Pennant — Free USA Shipping! 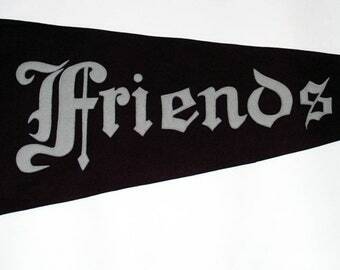 1930s-'50s Era Sewn Letters Souvenir Felt Pennant of Friends School Baltimore — Free Shipping! 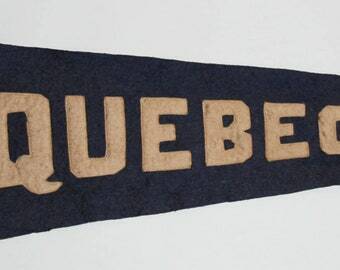 1940s-'50s era Souvenir Sewn Letters Quebec Felt Pennant — Free USA Shipping! Early Fort Frances Ontario Canada Sewn Letters Felt Pennant -- Free US Shipping!